you want in your backyard garden. the design process I call this process 'unpacking' an image. You put any image through this process and generate a list of flexible ideas or criteria. your backyard. Some images may give you one idea, others will give you many. for the different activities, features or areas of your garden. way: they place certain activities or features where they think they should go in a backyard. designed individually with no links to others and often has no overall theme or concept. 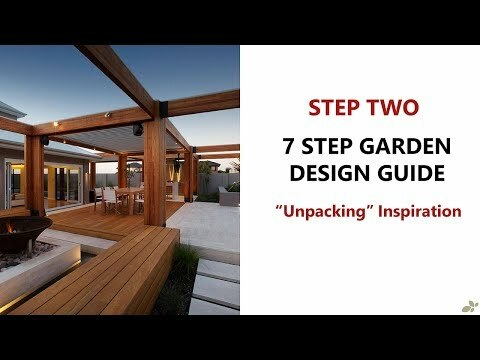 we want and go through the design process to find the best area in the garden for them. us use the local environment to shape the area for that activity or feature. focus on images as they're easy to find and plentiful. 1 thing in the image, or many and want to copy them all. want to include this activity, feature or item. or activity that will form the basis of my design. and again. Knowing when to stop and move onto to another area can save time. to follow for each activity or feature in your backyard. Ensuring you have ticked each box will let you know when you can move onto another area. I'm getting ahead of myself, but this gives you an idea of what this process aims to generate. again, I'm getting ahead of myself a little. unpacking process as I go through it. So let's have a look at unpacking. criteria of Must or Maybe ideas I may want to use in my design. in the image you like. Next, make 2 columns – one for physical elements, the other for design elements. of the materials for a component. thinking about spaces a little differently. out to me. I'll make some notes on the physical and design elements I like as well. The big one that caught my eye is the timber framework. different environments – such as a sloping backyard. and consistent, if not as rustic. that's fine. If not, grab another piece of paper and it's time to start sketching. – and you'll see that with my bad sketches later! as it is, or if there is some flexibility in how I can implement that idea. shade? What if I make the beams thinner, but only 1 solid beam? What if they are steel? Or another material? And what if I change the shape- perhaps curve them? to give me an idea of how it might look. Short and sweet. Personally, I like the timber over steel, and prefer the straight lines over curved. sizes and lengths of the beams. a bowl? What if I lower the pit closer to ground level? I'll make note of in the final step. out. What about the size of the pavers? Large vs small? Or the width of the timber slats? And let's remove the vergola – leave it open. Or can I replace it with a ceiling? The kitchen is a bit hard to see, so let's leave it for now. the paving is nice, but I'd probably be OK with changing it in my design. Timber Framework – Concept great (include if possible). Square cut timber preferred. Size and specific timber to match potential decking/ other timber used. Dining/ Kitchen – decking colour flexible. Prefer thinner slats. You will notice that I have mentioned a lot of physical elements and labelled them flexible. areas through using the same materials, colours or other physical elements. my future design. I love the timber framework idea and will keep it in mind when designing. but adapt to local conditions and constraints such as money, availability etc. doesn't and use your environment to create something unique and personal to you. physical and design elements you like about these components.